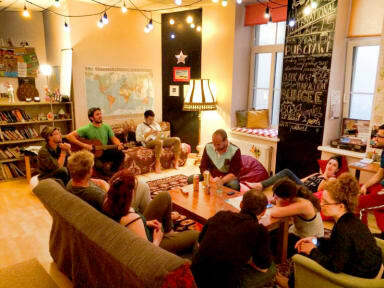 Cinnamon Sally Backpackers Hostel i Riga, Latvia: Bestill nå! The place to stay in Riga if you want more than just a bed. Super-friendly staff! Moved here from a different (also good) hostel to get some real atmosphere - was not disappointed! Great vibe in common room, comfy dorms and beds. Waffles breakfast and punch night was a welcome surprise! Best hostel in town, I assume.